As far back as 1980, I started doing research for my latest book, Gremlin Trouble about the unmade Disney animated feature film based on author Roald Dahl's first published book. It was a project that always fascinated me and intrigues many Disney fans. Disney intended to make a feature film that combined live action and animation that detailed the story of gremlins sabotaging RAF pilots and airplanes during World War II and then being convinced to ally themselves in the battle against the Nazis. 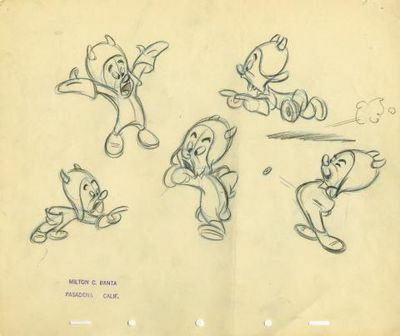 Animator Bill Justice designed characters like Gremlin Gus working in conjunction with Dahl who had quickly dashed off the story. The gremlins have recently resurfaced in new stories and merchandise produced by Dark Horse, as well as being key players in the Epic Mickey videogames. Despite quite literally decades of research, I knew that much of the information about the original project had forever been lost. People involved had died. Documentation had disappeared. After all, it was a film that was never made. As I tell people, there is always more to any story. One of the reasons I write so many articles and produce so many books is to try to garner corrections and additional information that often pops out of the woodwork from unexpected sources once something appears in print. Let me give you a little background before I share with you an amazing e-mail I received weeks after my book was published that fills in previously unknown information about the true origins of Dahl's notorious gremlins. While no one can deny the skill and popularity of Dahl's many books, it appears that he may have "borrowed" the story and character names for his first book from a friend and failed to give proper credit to that source. By the beginning of 1942, Flight Lieutenant Roald Dahl of the Royal Air Force had been relieved of active service as a pilot, due to medical problems he had sustained during a crash during World War II near Alexandria, Egypt. Sketches made of one of the "gremlins" from the Roald Dahl story. He was 25 years old, 6-feet, 6-inches tall. He was articulate and given to a tendency of dramatic exaggeration and imagination in both his writing and general conversation that would eventually make him one of the most popular storytellers of all time. He had a host of memorable books to his credit, including Charlie and the Chocolate Factory, Big Friendly Giant (BFG), James and the Giant Peach, The Witches, Matilda, Tales of the Unexpected, and many more. He spent two weeks in a convoy that crossed the Atlantic Ocean on his way to his new assignment as an assistant air attache to the British Embassy in Washington, D.C. To help pass the time, he made friends with another RAF pilot, Douglas Bisgood, who was heading for Canada to be an instructor in an officer training unit. Reportedly, the two pilots swapped stories about flying and gremlins. Gremlins who caused problems for aircraft and pilots had been a topic of conversation among the British air force since World War I. While in Washington, Dahl wrote a short story called Gremlin Lore that he hoped to get published. The manuscript was forwarded to Walt Disney who purchased the story. Bisgood would later contact the Disney Studios when he heard of them making a film on the subject, and an embarrassed Dahl would have to reluctantly verify that Bisgood knew quite a bit about gremlins before Dahl's manuscript was even conceived. A letter to Walt Disney, dated September 20, 1942 from Bisgood, outlined strongly his claims to the characters including the fact that terms like Fifinellas and Widgets were "family names which I claim as being my originals" and that Bisgood was planning to write his own book to use these creations. "Dear Mr. Disney, I learn with keen interest that you are making a film on 'Gremlins' but being the 'arch gremlin' I view with dismay the fact (if the press is correct) that you are using family names, which I claim as being my originals, and which I am in fact at the moment using in a book I am writing on the 'Gremlin Family'. "It may be that Flight Lt. R. Dahl has mentioned these titles to you as I discussed them with him when I was on my way to Canada this year. I am not so much perturbed at the monetary consideration as I am at my titles being used without any reference to myself. "I am enclosing a copy of a letter which I have already sent to Dahl, which speaks for itself. It might interest you to know that I am considered an authority on 'Gremlins' and it has been my pet theme for a very long time. I hope that your new film will be successful as the others but I do feel that I have a very definite claim on the family titles you propose using. Bisgood also wrote to Dahl (September 18, 1942) to remind him of the shipboard exchange where he entertained Dahl with his version of the gremlin story. There was a noticeable edge in the tone of the letter where Bisgood jokingly compared Dahl's cushy attache job in America with Bisgood's current situation where he had voluntarily quit his job training new pilots and had returned to service in his fighter squadron. Bisgood had even recently been awarded the Distinguished Flying Cross although he didn't mention it in the letter. "My Dear Roald, It may surprise you to hear from the Arch Gremlin who is at the moment in England….I say, old boy, what's all this about Walt Disney and the Gremlins? I read in the Times that he is making a film of the little fellas ….what careless talk have you been up to? Apparently my advice as the Arch Gremlin was not picked — you seem to have got it all taped, but who originated the chaps? "The names of Fifinella, Widget and Flippertygibbet are my own private property. Surely, old boy, the name of Bissie should appear in the film somewhere……I hope you have made a good story out of it, but don't forget that I shall take an extremely dim view of it if my name doesn't figure somewhere. It's not that I want my name in print, as that I am very seriously perturbed at the thoughts of Algy's relations, Fifinella, Widget and Flippertygibbet being incorrectly portrayed. "Consider the dreadful consequences if relations became strained between the commonwealth of the pilot world and the Gremlin hierarchy. The only way to put this right would be to call in some competent consultant. Who can this be? Who knows the little fellows? Of course, I am not suggesting that you send a Catalina MK.II to fetch me but you must agree that some action on parallel lines is vital. Walt, of course, had been operating under the assumption that while the general concept of gremlins was part of the RAF mythology, the particulars of the story, including the unique names, were solely Dahl's creation. However, with so many other claimants of gremlin authority suddenly appearing when it had been announced Walt was considering making a feature film, Walt was still willing to give Dahl the benefit of the doubt that Flight Lt. Bisgood was just another pilot wishing to jump on the bandwagon. Dahl had never shared with Walt the story of that Atlantic crossing where Bisgood and Dahl exchanged gremlin stories. "I have a letter from Flight Lt. Douglas Bisgood in which he enclosed copy of his letter to you. I am answering him and copy of my reply is enclosed. If you have any feeling that this fellow may be inclined to cause trouble, I believe it would be wise to straighten it out now, but I may be unnecessarily concerned about the matter. "However, with a thing of this sort it is natural to expect a certain amount of jealousy, but nevertheless when we undertake the production of a film, the cost of which runs into many thousands of dollars, we must surround ourselves with every precautionary measure. I would appreciate your reactions to this particular situation." I am glad to know of your interest and the part you have played in connection with the Gremlins. However, I don't want you to be too severe with Flight Lt. Dahl. Frankly, I do not believe he has misrepresented anything to us. He has been very unselfish in his attitude toward the whole matter. He has presented the Gremlins as a collection of stories and incidents that have sprung up with the boys in the RAF. "The deal we are consummating with Flight Lt. Dahl for the use of these characters is one where the royalties go to the Benevolent Fund of the RAF, so you see it is not entirely a personal thing with him. It has the full cooperation of the British Air Ministry, and Commander Thornton of the British Embassy in Washington has entered into the project. "It is our hope that this film will help to bring about a better understanding between the British and American people. We hope, too, that our screen treatment of the Gremlins will meet with your personal approval and that you will look upon it with pride in knowing that you, as one of the RAF boys, have contributed your share to Gremlin-lore. "I know Bissie very well and have many a time discussed gremlins with him; he is without doubt an eminent Gremlinologist. I do not think, however, that you need take anything he says too seriously and I am quite sure that he will not cause any trouble. "More particularly when he finds out how we are treating the matter and what we are doing with the proceeds." Perhaps because profits were earmarked for the RAF Benevolent Fund and that the film was never made, Bisgood never did cause any trouble or send any further communication. He died soon after the war in 1947. In March, I received the following e-mail from Bisgood's son that sheds new perspective on the origin of the gremlin story that Disney was intending to develop. I am happy to give recognition to a talented and forgotten RAF pilot who seems to be the true source for those troublesome gremlins and for decades receiving no credit. I am the son of Douglas Bisgood who you have mentioned in your book. May I congratulate you on an excellent well-balanced story with regard to my father's dealings with Roald Dahl and The Gremlin story. It may interest you to know the following. Although my father was killed in an air crash in 1947 my mother brought me up with the following story, relevant to your book. She showed me the original letters reproduced in your book. I was brought up on the Gremlins and still have the original book that my father used to read to me. Plus a pristine copy of the original edition. My father always claimed that Dahl had poached the complete storyline from him in their discussions on the ship over to America. The following details may interest you. As you correctly state Gremlins were known by all RAF pilots, but my father had a terrific sense of humour and was also a very talented artist and good with his hands. I have in front of me as I type examples of his oil paintings and the original Gremlin Gus puppet he made while convalescing in the Battle of Britain. A year before he met Dahl. My father was a Battle of Britain ace who was awarded the Distinguished Flying Cross. He crashed during the Battle of Britain in his Hurricane and was seriously injured. He wrote his original story about the gremlins while convalescing in a hospital bed in August 1940. Note please that my father's name was Douglas and he was called 'Gus' by his comrades. My mother was called Fifinella in the photographs in the family album. My father was passed fit to fly again in 1941 and went over to Canada to instruct fighter pilots. He wrote his version of The Gremlins describing how they helped him get fit enough to pass the medical required to fly again. This was the story he told Dahl on the ship. He continued flying throughout the rest of the war … was involved flying over France on D-Day and was then in Burma after the war in Europe had finished. At the time of his death he was a Wing Commander, commanding the airfield that is now Belfast International Airport. His Halifax was lost over the Atlantic with its crew of 10 in April 1947. According to my mother (who was an officer in the WAAF during the war), he always regretted telling HIS story to Dahl and claimed that Dahl hardly changed his original story at all. My Aunt Mavis (my father's sister) is a hale and hearty 97, totally switched on lady who was also in the WAAF during the war. She remembers very well travelling with 'The Boys' as she called them, in their sports cars down to Brooklands Race track where my father raced for Frazer Nash before the war. She was also called Fifinella by my father and she claims that all the names, Gus, Jamface etc were the nicknames of my father's friends … this was in 1939! I was brought up as Gremlin 1 and, although I was only 18 months when my father was killed I have no doubt at all that all the above was true. That my father had a sense of humour is obvious by the fact that he would always paint his own insignia on every plane he flew in. A skull and crossbones under an umbrella with the insignia Semper in Excreta. I need not translate I am sure! Again … I have the original in front of me. So, thank you again for being so even-handed in your book. I am more than pleased because it also verifies the story that I have passed down to the young Gremlins and Fifinellas in my family who are intensely proud of their grandfather and great-grandfather. You may be interested to know that he flew throughout the entire war, was awarded many medals in addition to the DFC … flew in over 50 different aircraft as pilot …. etc. I have his log book to hand which, with his photographs is an incredible record of the Second World War in the air. His name as One of The Few is recorded at the Runnymede Memorial, Capel Le Ferne Memorial and the Memorial to the Few by Westminster Bridge). No apologies for mentioning this as I am very proud of him. One photo shows my father's Hurricane after the crash in the Battle of Britain in 1940. Amazing that he survived at all. He claims the crash was caused by Gremlins lifting up the runway and carrying it away as he landed in thick fog! He was very badly injured, broken back and many other injuries but was determined to fly again. Thus the Gremlins and Fifinellas helped him to pass the medical … as in the book. This was the story passed down to me by my Mother and elder cousin (who remembers my father telling her hilarious stories about gremlins). He was too damaged to fly fighters again so he spent the rest of the war flying 'the big kites' as he called them. Blenheims, Lancasters, Hudsons, Halifax's, Catalinas, Liberators, B17's, Dakotas (towing gliders over France on D-Day and flying in Burma to support the allied troops against the Japanese etc). He was the first pilot in the newly formed Meteorological Squadron which is today's Air Sea Rescue(all listed in his log book). In fact, his log book shows that he flew over 50 different types of aircraft in Coastal Command, Fighter Command, Bomber Command, Transport Command and as an Instructor. He got about a bit! Finally, although my Mother said that he was irritated that Dahl had stolen his story he was not vindictive … just sad I believe. I think in a way he felt cheated that somebody who had a 'cushy life' in the war (his words) had started his career by stealing a story. (Again my father's words). There is a picture is taken of him in the convalescent home after the crash. He made puppets of Gremlins (as he saw them … before you Disney people got so brilliantly creative). Only one of his puppets survives and sits on my desk. He is actually helping me to type this at the moment. There is another letter recorded in one of Dahl's biographies which you probably read but was not necessarily relevant to your book. In it my father takes a bit of a swipe at Dahl for having an easy time of it in Washington while my father was engaged in the dangerous pursuit of flying unarmed Liberators across the Atlantic. I think he mentions that he hopes no 'nasty gremlins' could get in the works. I think this was the closest my father got to putting his irritation into words that, in his view, Dahl had borrowed his Gremlin story in toto. This does nothing to detract from the brilliance of Dahl's writing (I am a great admirer of his stories and talent) but it is such a shame that he managed to get a start in the world of writing in such an underhand manner. That he then went on to claim originality of the whole concept only makes it more sad. On a final note, the fact that all proceeds went to the RAF Benevolent Fund benefited me. As the son of a deceased war hero, the RAFBF paid for all my schooling. So the Arch Gremlin and Gremlin Gus looked after me in the end!! Sorry to ramble on but I just thought you might be interested.